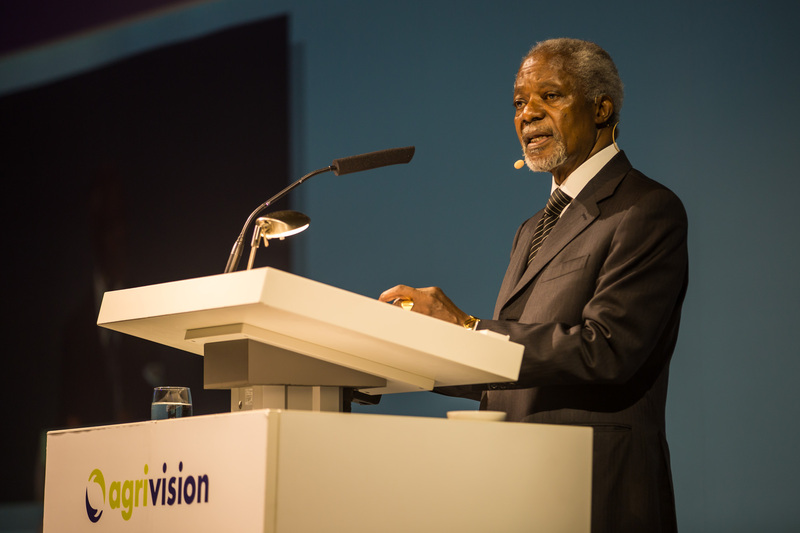 This speech was given by Kofi Annan on 15 June 2017 at the Nutreco AgriVision and AquaVision Conference in the Netherlands. Despite past progress, one in nine people does not have enough food to eat. Another two billion may eat, but their meals lack the nutrition necessary for proper health and development. These terrible failures are preventing children, communities and nations from reaching their full potential. And the situation is set to worsen dramatically over the next decades due to global population growth, rapid urbanization, and an ongoing dietary transition in many parts of the world towards processed food and a consumption of meat beyond what is essential for proper health. If these trends continue, food production must double by 2050 to meet the world’s growing demand. But our planetary boundaries are already reaching their limits. Environmental degradation and natural resource depletion continue unabated. Conflict, instability, and the growing impacts of climate change risk pushing millions more into abject poverty and hunger. And as always, it is the world’s poorest who are paying the highest price. It is a moral outrage that some 30 million people in four countries alone – South Sudan, Somalia, Yemen, and Northern Nigeria – are currently at risk of famine and starvation. The challenges to feed the world are huge, but fortunately we are not starting from scratch. With the Sustainable Development Goals, governments worldwide have adopted a compelling vision with ambitious goals. Fulfilling these ambitions requires an unprecedented effort by all sectors of society, and business must be at the heart of this endeavor. Far-sighted companies have long understood that this is neither about altruism nor charity: ‘Doing good is good for business’. We must always remember that business cannot succeed in a society that fails. Smart corporate leaders and entrepreneurs are already embracing new technologies to deliver wider goals of sustainable development, including improving access to food and clean water, to sanitation, healthcare and education. They are building alliances and partnerships to drive innovation, create jobs, and advance equitable growth without forgetting the implications for the environment. I am convinced that we are entering an era in which companies that are integrating responsibility and sustainability into the core of their operations will be the market leaders of tomorrow. Today I want to share with you my thoughts on the challenge of hunger and malnutrition and the contribution your industry can make in tackling it. First, to reach the SDG 2 that calls for ending hunger by 2030, we need to increase agricultural productivity and production, particularly in developing countries. Africa, for example, has largely been by-passed by the “Green Revolution”, which saved millions of lives and accelerated economic transformation in Asia and Latin America – despite some negative social and environmental drawbacks. Despite huge agricultural potential which could transform Africa into a surplus exporter, Africa spends around USD 35 billion each year importing food. To change this, we need to start treating smallholder agriculture, which is predominant in Africa, as a commercial business and enable the private sector to intervene and invest along with governments. Smallholder farmers, who produce approximately 70% of all food consumed worldwide, have to remain at the core of our activities, but larger commercial operations also have a role to play. They can share market access, improved seed varieties and advanced farming techniques with smallholders. The greatest success will come if all stakeholders work in close partnership. Second, as the world’s population rises to more than 9 billion by 2050, we must produce more food with less land, water and other resources. Regulatory frameworks need to be put in place and enforced to ensure that natural resources are managed in a sustainable manner. The public and private sectors have to increase investment in research and innovation to improve both the productivity and sustainability of food production, with due respect for biodiversity and the environment. This must include delivering on the Paris Agreement on Climate Change by reducing carbon emissions, driving investments in clean technologies, and improving the resilience to the multiple impacts of climate change. I am glad that Nutreco and other far-sighted companies are already implementing ambitious business practices to improve responsible water stewardship, reduce waste, and use energy resources more efficiently. Third, we need to put a much bigger emphasis on the quality of our diets, rather than just focusing on quantity. Research has shown that the economic returns from investing in nutrition are huge as better nourished populations are more productive. According to the Global Panel on Agriculture and Food Systems for Nutrition, reducing stunting by 40 percent by 2025 can result in more than $80 billion in additional GDP growth in just 15 sub-Saharan African countries. In Ghana, my wife and I have seen first-hand how biofortified Vitamin A-rich sweet potatoes are helping address stunting in children and improving the health of pregnant women and mothers. We need governments to urgently adopt the right policies and mobilize resources to scale-up nutrition. This is why I support the African Leaders for Nutrition – a joint initiative of the African Development Bank, the Global Panel on Agriculture and Food Systems for Nutrition, and the Gates Foundation, which advocates for more investment in nutrition. The food industry must support these efforts by providing consumers with access to more nutritious and healthy foods. Livestock, aquaculture and fisheries are particularly important sources of nutritious food. They provide good quality protein to hundreds of millions of people around the world and are contributing to improving the well-being of poor and disadvantaged communities in many developing countries. What is important is that these sectors expand in a regulated and environmentally-friendly manner, which must, for example, include reversing the current trend of overexploitation and pollution of our oceans and inland waters. Fourth, we always have to ensure that the health and safety of the consumers remain at the core of all our efforts. High food safety and nutrition standards have to be put in place along the entire agri-food chain to protect against foodborne diseases. It is also critical that we keep animals healthy and productive through good nutrition and farm practices rather than the extensive use of antibiotics, which could lead to human resistance to antibiotics with all its deplorable consequences. Fifth, we have to ensure that our actions improve the lives of people everywhere. A vibrant food and agri-business sector is essential to increasing food security, tackling poverty, and driving inclusive economic development, particularly in poor countries. Studies by the World Bank have shown that growth in agriculture is up to four times more effective in raising incomes among the poor than growth in any other sector. By engaging the poor, business can also create much needed jobs – especially for youth, thereby allowing them to remain in their villages with gainful employment, rather than having to migrate to urban areas, often for non-existent jobs. All these efforts must be underpinned by a strong commitment to international standards of human rights across companies’ operations and supply chains. And finally, governments must put in place a political environment premised on respect for the rule of law and good governance to provide the predictability, accountability, and transparency that is so important to the private sector and society in general. We clearly have an ambitious agenda ahead of us, but I am confident that we can turn aspiration into action and build a food secure, prosperous and sustainable world. As I have said before, healthy societies must be built on three pillars: peace and security, inclusive development, and the rule of law and respect for human rights. There can be no long-term peace and security without development. There can be no long-term development without peace and security. And no society can long prosper without respect for the rule of law and human rights. Your leadership, actions and example must play an important role in this effort. So let us all – business, the public sector, and civil society – live up to this responsibility by working together.